Mr. and Mrs. William K. Warren's City of Light added a third Grade 1 win to his resume in the Breeders' Cup Dirt Mile on Saturday, taking the lead at the start and never relinquishing it to cross the wire a 2 3/4-length winner. The 4-year-old son of Quality Road, ridden by Javier Castellano at odds of 5-2, covered a mile over Churchill Downs' fast main track in 1:33.83. It was the first Breeders' Cup win for trainer Mike McCarthy, and Castellano's tenth. “I can't tell you how long I have been waiting for this,” McCarthy said. “I always thought this would be a mismatch. I have been looking forward to this for quite a long time. I thought he would love this racetrack. Backing up to one turn where his best races were, I thought he would run away and hide and he did just that. The previously undefeated Catalina Cruiser, sent off as the 4-5 favorite, finished off the board, bringing trainer John Sadler's Breeders' Cup record to zero winners from 43 starts. Seven Trumpets was quick out of the gate while favored Catalina Cruiser broke awkwardly to the outside. Sent from his rail post position, City of Light cruised up into the lead under Castellano, taking a one-length advantage through fractions of :22.64 and :45.16 down the long backstretch of the one-turn mile course. Behind the leader, Seven Trumpets, Firenze Fire and Catalina Cruiser were three across the track to share second position, and eventual runner up Seeking the Soul was at the rear of the field. Rounding the far turn, City of Light never looked seriously threatened, flying down the lane to win by 2 3/4 lengths. Seeking the Soul rallied from well back to finish second, besting Bravazo and Seven Trumpets. Catalina Cruiser did not first and finished in sixth position. Bred in Kentucky by Ann Marie Farm, City of Light was a $710,000 yearling prospect at the Keeneland September sale. He has never finished worse than third in his 10 lifetime starts, winning half of them, and boasts earnings of over $1.7 million. 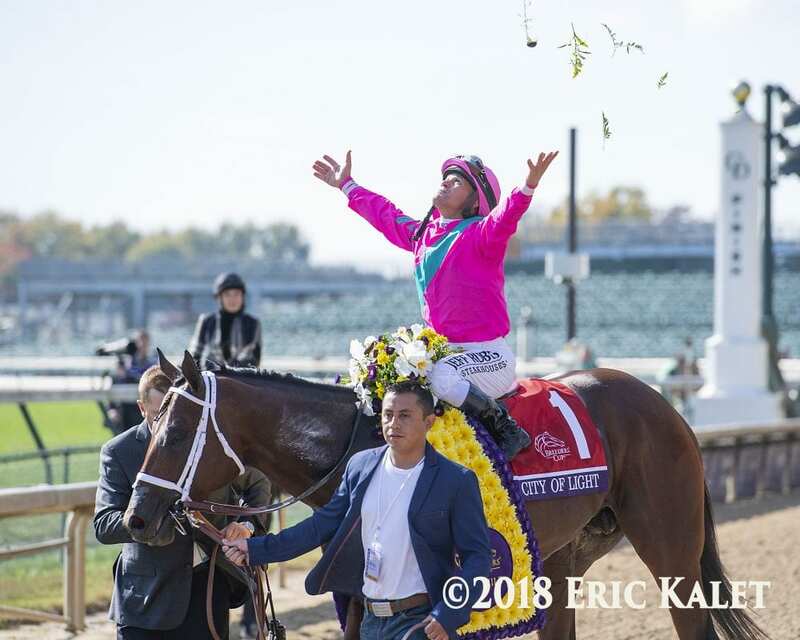 This entry was posted in Breeders' Cup, Videos and tagged Breeders' Cup, breeders' cup dirt mile, catalina cruiser, churchill, churchill downs, city of light, Javier Castellano, miek mccarthy, Quality Road by Paulick Report Staff. Bookmark the permalink.